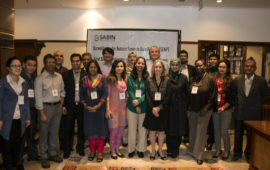 Bangkok, Thailand – June 13, 2012 – Today in Bangkok, the Coalition against Typhoid (CaT), an initiative of the Sabin Vaccine Institute, brought together global health leaders from across Asia to discuss the high burden of endemic typhoid and the growing number of typhoid outbreaks in the region. Experts called on policymakers and ministries of health to make typhoid vaccination a priority in their countries. Despite a WHO recommendation and the prioritization of typhoid vaccines for “immediate” implementation at a 2009 WHO SEARO meeting, many countries in Asia have yet to recommend or introduce typhoid vaccines. According to the WHO, typhoid impacts an estimated 21 million people and causes more than 200,000 deaths annually, predominantly among preschool and school-age children in developing countries of Asia and Africa. WHO reports that 90% of typhoid deaths occur in Asia. “WHO approved typhoid vaccines are available now, yet these tools are not yet fully embraced by ministries of health across Asia,” said Dr. Jeremy Farrar, Director of the Oxford University Clinical Research Unit in Vietnam. 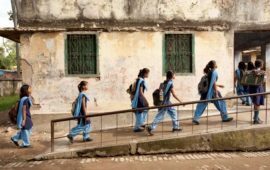 Typhoid infection impacts school attendance and achievement and limits workforce participation and productivity. Typhoid is widespread in poverty-stricken communities without access to safe water and basic sanitation and spreads through contaminated water and food. To conclude today’s event, the panelists emphasized the need for improved surveillance and control programs throughout the region, noting that in order to have the greatest impact, typhoid vaccination efforts must be implemented in conjunction with other public health programs, such as access to safe drinking water and the promotion of good hygiene practices, including hand washing. 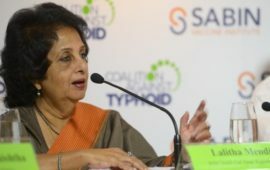 To learn more about the typhoid burden in Asia and to view a full list of speakers from today’s event, visit the Coalition against Typhoid website here.